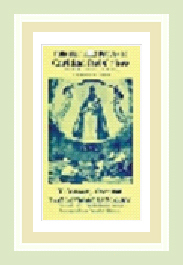 PREPARATION: Saint Anthony is known to answer the prayers of those seeking a Special Favor. He is reknowned for helping folks find lost things (including people) and assisting those who desire marraige. Light an anointed Saint Anthony Candle while you soak in Special Favor Bath. 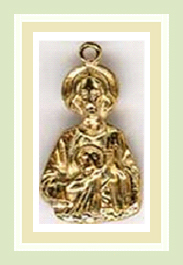 Anoint the amulet with Saint Anthony oil and place it under your pillow. Pray yourself to sleep, asking St Anthony to fulfill your request. Anoint yourself daily with Saint Anthony perfume. 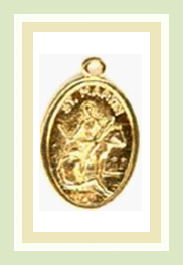 Carry the amulet and pray to St Anthony until your request is granted. PREPARATION: To make you enemies disappear, light a St. Expedite candle on Friday and carry his medal for spiritual protection. To make your magical workings manifest more quickly, add the talisman to a magical lamp or place in a Yellow Candle. Many folks write their desire in the background of a St. Expedite image and turn it on its head (upside down) while burning a candle. If you do this, put your amulet in a glass of Holy Water next to the candle so that between the image, candle and glass you have a triangle shape. Begin "expeditious" work on Wednesday. PREPARATION: Light a White Ellegua Candle to have roads opened for success and new opportunity. Place a cup of Black coffee, sweetened with sugar next to your candle and amulet to charge it. For protection, light a Black and Red Ellegua candle and anoint the amulet with Coconut oil. Your amulet can be placed behind the front door after the candle has burned out. Many folks carry this amulet with coffee beans in a black and red mojo bag for protection against violence. PREPARATION: To force a male lover or husband to return to you, each week light a Pink Candle and say St. Elena's prayer nine times. Take one nail and put it through the heart section of a photo of your man. Place this image before the candle. To have three wishes granted, soak the three nails in Siete Machos perfume while saying St Elena's prayer seven times. Carry them in a red flannel bag along with money and a pair of lodestones. PREPARATION: Light a Saint Barbara candle on you altar and place the charm in front of it. Place five red apples on your altar. Anoint the charm each morning with Saint Barbara oil. PREPARATION: Light a St. Martha candle on a Tuesday when asking her to dominate another. Say her novena nine times. PREPARATION: Each week clean the amulet with a fresh Sweet Orange. Then Light a Yellow Candle or Caridad del Cobre Jar while you soak the amulet in honey overnight. Anoint the following morning with Oshun oil . 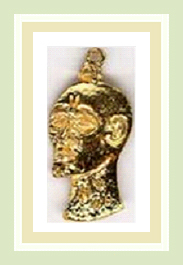 Carry the amulet and pray to Oshun for love, fertility or luck matters. PREPARATION: Light a St. Martin Caballero Jar and place nest to the amulet on your altar. Anoint the charm regularly with gambling, money drawing or luck oil. 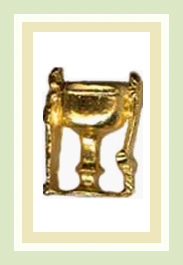 Carry the amulet for success at gambling and games of chance. PREPARATION: Each week clean the amulet with perfume. Anoint the charm weekly with Guardian angel oil. 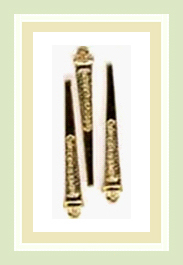 Recharge the amulet by placing on your altar with a Holy Trinity candle. 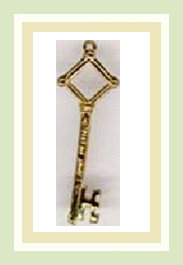 Carry the amulet for protection and faith in your spiritual workings. 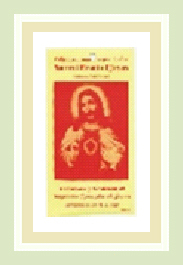 PREPARATION: Light a Sacred Heart of Jesus candle while you soak the amulet in holy water overnight. 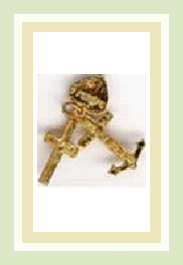 Carry the amulet and pray to Jesus for all matters. PREPARATION: Light a green candle to the Patron Saint of "lost causes" on Wednesday. Ask him for a healing or financial miracle. Make a promise to publish a "Thank You" when he performs his task. PREPARATION: Light a St Lazarus candle on a Sunday to ask for Spiritual healing. 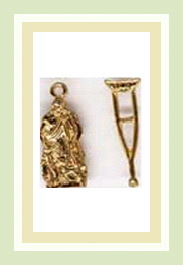 Wash the crutch talisman in dry white wine. PREPARATION: Light a St. Martin de Porres candle while you soak this amulet in rum. 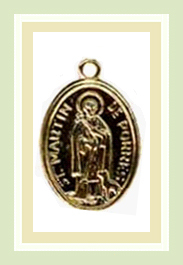 Carry the amulet and pray to St martin for health, family issues and to relieve financial hardships. 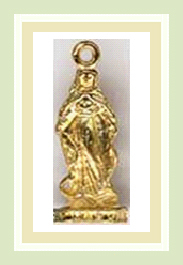 PREPARATION: Light a St Peter Candle while you soak this amulet in Abre Camino perfume. 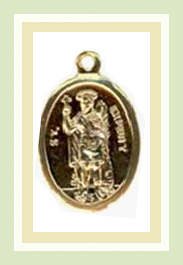 Carry the amulet and pray to St. Peter to open doors to new opportunities. 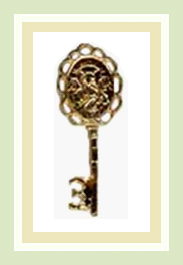 PREPARATION: Each week clean the amulet with Florida water. 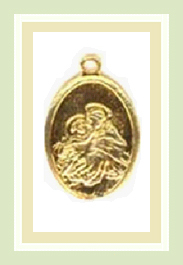 Carry the amulet and pray to Perpetual for love, fertility and spiritual protection. Contact Bianca to make your purchase & if you have any questions.